Relax, be energetic or get fit: it's up to you. Everything is possible in this enchanted place where the human meets the divine. 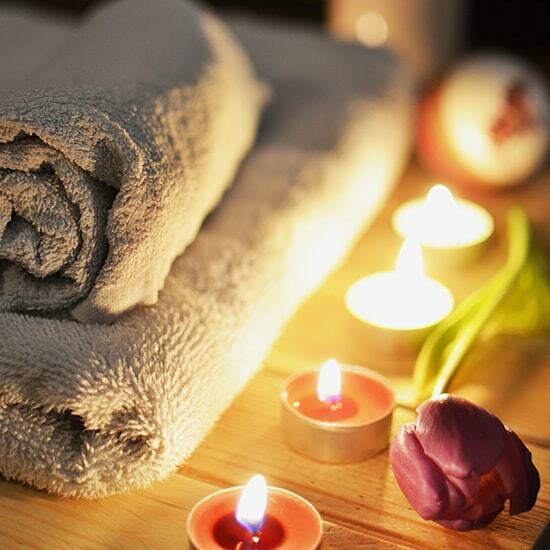 A moment of pure relaxation can begin with a massage or treatment. A peaceful moment to pamper yourself, to improve your circulation, balance your energies and eliminate toxins. To book your treatment or massage sessions, please contact our concierge. By reservation only, from 10:00 a.m. to 6:00 p.m.
For your comfort and well-being, Château de la Chèvre d'Or features a sauna and Jacuzzi with panoramic views, and a fully equipped fitness room that will take your treadmill journey to extraordinary places. You can also enjoy strolling through our beautiful gardens, or for something a little more challenging, through the village streets to the summit. All of the above, will keep you fit, lively and in good humour throughout your stay. AT CHÂTEAU DE LA CHÈVRE D’OR LIFE IS SWEET. MAKE THE MOST OF OUR OUTDOOR SPACES FOR TOTAL RELAXATION AT THE GATES OF PARADISE... WHEREVER YOU GO, BY THE POOL, ON ONE OF OUR TERRACES, OR IN OUR GARDENS, YOU'LL FIND IT EASY TO DREAM AND UNWIND. At Château de la Chèvre d'Or we aim to free your mind and your body. 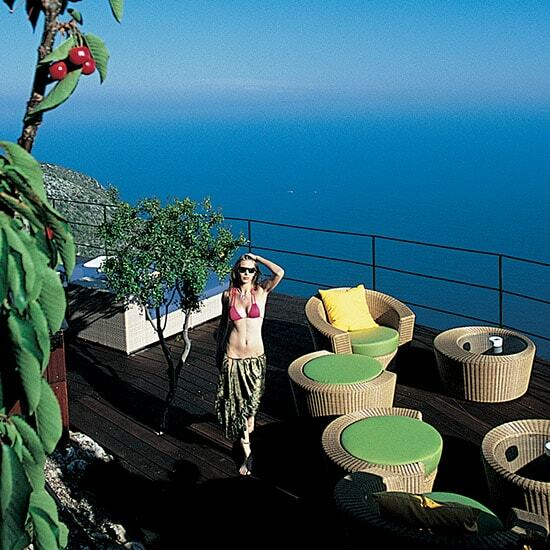 Enjoy the languid pleasure of sunbathing on the suspended terrace. To escape, wander in our different gardens. Take one of the small, charming staircases to discover somewhere new each day. Calm reigns for a perfect stay. Enjoy every peaceful moment, moments of pure happiness. Enjoy an unforgettable stay at the Château de la Chèvre d'Or by sharing original and personalized experiences. The coast is so beautiful from the sky! Departing from Monaco or Nice, you can take off to any destination throughout the entire region and its hinterland (Cannes/St-Tropez/Portofino…) You will discover the beauties of the French Riviera from the sky. From 650€/pers. From the sky, the côte is so beautiful! One of the “Must” is to fly to St-Tropez in order to avoid traffic jams, if you suddenly feel like a quick trip to St-Tropez an helicopter can drop you off in 20 minutes flat either to your preferred golf or to a prestigious restaurant. Take off from Monaco, head along the coast from the Principality to Cabbé bay, Menton, small villages on the hills of Menton, Ste Agnès and Gorbio,afterwards Roquebrune and back by the Cap Martin. Take off from Monaco for a similar tour on which you add flight over La Turbie, then direction to Villefranche bay and Cap Ferrat. Take off from Monaco for same tour as 20 minutes one, extended to Cap d’Antibes, Cannes, Lérins islands, St Paul de Vence, Nice, Beaulieu and back by Cap d’Ail. Drive one of the car of your dream. From La Chèvre d’Or you will drive a luxury model (or just as passenger) on one of the French Riviera Roads. From 550€. Driving one of the car of your dream. At every age, you can enjoy these convertibles and experiment the driving sensations along the most spectacular roads of the French Côte d’Azur. The magnificent village of Eze offers you the opportunity to drive on the scenic and winding roads of medium and large cornices and enjoy the panoramic views of Monaco, Eze … till the Italian border. A romance from Eze to Saint-Tropez! Climb aboard to go visit Saint-Tropez on a mythic open boat. You will enjoy the beautiful scenery of the Côte d’Azur. From 2450€. A romance from Eze to Saint-Tropez! Climb aboard to go visit Saint-Tropez. On a mythic open boat. You will enjoy the beautiful scenery of the Côte d’Azur. Discover the village and its famous beaches. After lunch, either a swim or a nap in the warm Mediterranean sun… A memorable day. Departure: Between Monaco and St Tropez. Time of travel: Between 1h30 and 2h30 depending where you boarded. Enjoy the comfort of our sauna, eyes immersed in the Mediterranean and extend the fun by one of our massage outside to commune with magic. Extend the “zen” feeling with yoga or Tai Chi lessons in our gardens and breathe scrubland and gorse mixed in the spray of the Mediterranean. From 120€/care. Gold beauty care. The Château de la Chèvre d’Or is relaxation & scenery guaranteed ! Discover Eze and its surroundings on foot! Always higher towards the “Oppidum” situated on the peak of the high cliff road, starting by a dive in the blue, then continue to walk along the Roman ruins and arrive almost to the sky. From 50 € / pers. From 50€/pers. Eze and its surroundings by foot. «There is always some madness in love but there is always some reason in madness.» Thus spoke Zarathustra. Walk along the path that has punctuated these words and let your steps move with your thought. You can take with you a genuine picnic bag upon reservation. What could be more romantic than getting on board on a sunseeker of 32 foots at the end of the day to take advantage of the last rays of sunlight with a glass of champagne. From 800€. A sunset signed Côte d’Azur. Your captain knows the landscape under the magic of the summer lights. While sipping a glass of Champagne, relax while taking whether a bath in the Sea or tanning on deck… We propose you different models, modern and open ( Sunseeker 32 or new generation Van Neerlandais ) or a classic Riva. Depart from Beaulieu-Sur-Mer, for a tour of about 2 hours, to admire the beauty of the coast illuminated; it is never as beautiful as at this moment and you will spend an unforgettable experience. French Riviera rhyme also with culture! If you are tired of glitter en route to the culture & take advantage of our exclusive partnership with the MAEGHT Foundation. For a VIP or private visit of this unique collection in St Paul de Vence and visit this beautiful village, its numerous galleries and delicious ice cream makers! A true museum in nature, the Maeght Foundation is an exceptional site that contains one of the most important collections in Europe, with paintings, sculptures; drawings and graphic works of modern art from the 20th century (Bonnard, Braque, Calder, Chagall, Chillida, Giacometti, Léger, Miró, Ubac…) and contemporary artists (Adami, Calzolari, Caro, Del Re, Dietman, Kelly, Mitchell, Monory, Oh Sufan, Takis, Tàpies…). More than 200,000 visitors come each year to the Maeght Foundation, which has put on over 100 monographic or thematic exhibitions since its opening. The Maeght Foundation is dedicated to art from our era. During the temporary exhibitions, only a part of the permanent collection is on display. Many exhibitions are also organized every year in museums in France and abroad based on the Foundation’s collections. Opening times: every day, October-June: 10am – 6pm / July-September: 10am – 7pm / Closed at 4pm on December 24th and 31st. Ticket office: closes 30 minutes before closing time. Restauration: Café F is open for lunch or snack. Opening hours according to the season. Information 04 93 32 45 96. For one day awaken all your senses with a dazzling beauty program, wonderful scents & smells, tastes incredible. Floral art lessons ; perfume creation ; guided tour of the exotic garden ; meal in our gourmet restaurant LA CHÈVRE D’OR **. From 500 € / pers. From 500‎€. A workshop of senses. From your room at la Chèvre d’Or, by the pool or directly from your living-room, you can now book a yacht in a few clics online and experience a wonderful day or more on the open sea. Fill out the following form for a reservation or information request concerning one of the experiences listed above.